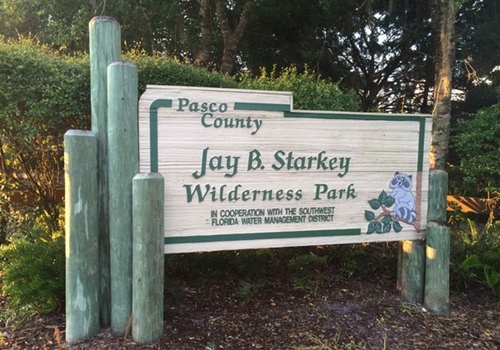 The 8,000-acre park connects to the 42-mile paved Suncoast Trail via a 7.5-mile paved trail. There are 16 tent camp sites with no hookups, shared bathhouse/restrooms and a small shelter. RVs are prohibited. The campsites share water spigots that are scattered around the grounds There are 3 remote (primitive) camping sites without any facilities on the 12.6 miles of marked hiking trails. There is a Small cabin (4 people max) $20/$25 night and Large cabin (8 people max) $30/$35 night. 10500 Wilderness Park Boulevard New Port Richey, FL 34655. 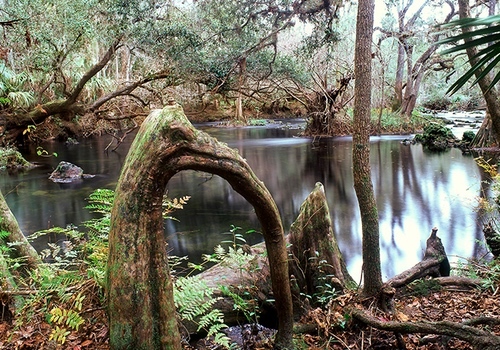 Hillsborough River State Park offers RV and tent camping with electric on most of its 112 campsites. 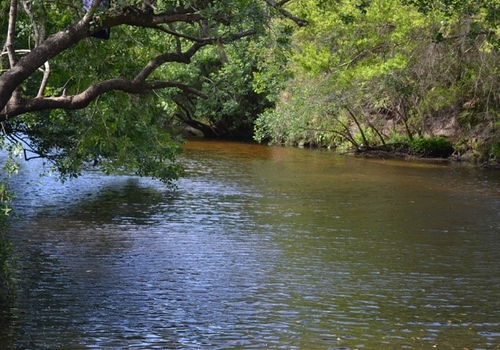 The Hillsborough River cuts through the park, offering opportunities for fishing, canoeing and kayaking. A primitive camp, located across the river is available via foot trail. Bicycles permitted on the 2.2-mile Park Loop and the 1.6-mile Wetlands Restoration Trail. Rates: $24 per night, includes water and electric. Some walk-on sites. Located directly on Tampa Bay, this park was eveloped from 258 acres of native mangroves with open land areas and intertwined with waterways. There are 98 campsites, all with electricity, potable water, picnic tables, and barbecue grills. . Almost all sites back up to a canal, where you can launch small boats from your site. Campers also have access to the park’s 18 picnic shelters, public restrooms, hot and cold shower houses, and 2 RV dump stations. There is a 700 ft public beach along Tampa Bay and boat launch, as well fishing piers and shore fishing. 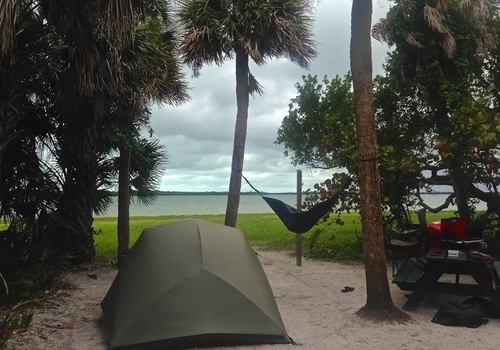 Fort De Soto Park has some of the finest camping facilities in the St. Petersburg area. There are 238 campsites for tent and RV camping with most of them being waterfront, 85 sites are set aside exclusively for tents, vans and popup campers. Located right on the bay, you can enjoy canoeing, swimming, fishing off a pier and nature trails. Facilities include restrooms, a playground, showers, grills, RV hookups and a camp store. Dogs are allowed in designated areas only. Rates: RV, $38.50; Waterfront RV, $40.50; Tent, $33.50; Waterfront Tent, $35.50. 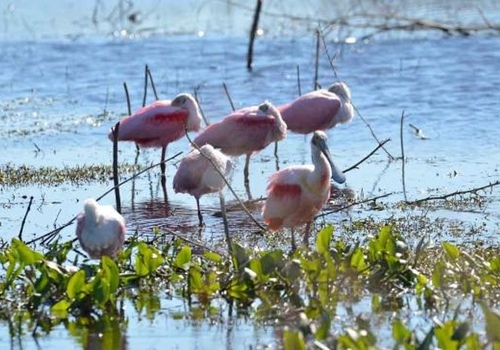 The park comprises 2416 acres along the Little Manatee River that flows about 40 miles before emptying into Tampa Bay. Approximately 5 miles of the river flow through the campground. Campsites are reservable year round. Activities include hiking, canoeing, horse trails, and camping. There are 34 campsites with full hookups. This park is popular with equestrians. A 6.5-mile nature trail is available for hikers, and the river is open to exploration by kayakers and canoeists. Rates: $22 per night. This 160 acre campground has 40 sites for RV, tents and trailers with fire ring, table, water and electric hookups. (Dump station on site). The campsite is known for its crystal clear natural spring from which water flows year-round at a temperature of 72 degrees and is excellent for swimming. The spring feeds the Alafia River, offering multiple canoe and kayaking opportunities. Rates: $24 ($18 for seniors)..